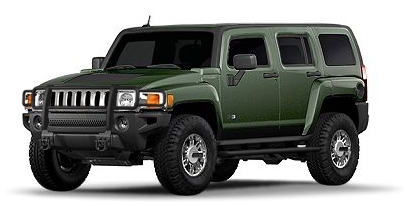 Ellen and I went to the local shopping center to get a bite to eat and we ended up parking by a brand new Hummer H-3. I was impressed with the looks of one. About the size of an Expolrer, but the shape of a Hummer. I went on line to check into them some more. Pretty impressive. They are using the 3.5L Vortec V-6 in front of a five speed stick (automatic optional). Gas mileage is about what my S-10 Pickup gets (16-20), so that wouldn't kill to bad. The price for how I want it is around $32,000. Best of all, Ellen didn't freak out about it and actually would allow me to get it! I could trade in the truck and the Vibe, use my Raytheon discount and do pretty well! I would get a little trailer so I wont lose all of the usefullness of a pickup. I have yet to go to the dealer and test drive one. I am afraid to do it right now because I would most likely come home with it! Now . . . to get a stocking big enough . . .